Cottage season is just around the corner, so get ready to dust off your water skis, wakeboards, and tubes — or paddle boats, kayaks, and canoes, if those are more your speed. 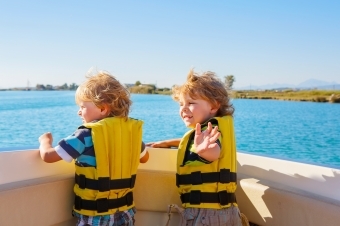 Before you head out on the water this season, consider these five tips for safe boating. See and be seen. No matter which kind of boat you’re in, visibility is key. Not only do you need to make sure you have a clear view of your surroundings, but other boaters should be able to see you, too. During the day, wear polarized sunglasses to banish the bright glare that reflects off the water. At night, make sure all of the lights on your boat are in good working order and turned on. Suit up. In Canada, you’re required by law to have a lifejacket or personal floatation device (PFD) on board for each person on a watercraft, including human-powered boats like canoes, kayaks, and rowboats. So, what’s the difference between a lifejacket and a personal floatation device? * Generally provides better floatation and thermal insulation than a PFD. * Usually provides less floatation and thermal protection than a lifejacket. * Colour selection is limited to red, orange, or yellow for greater visibility. * Wider variety of colour options (darker colours reduce visibility). * Designed to turn you onto your back so your face doesn't rest in the water, even if you're unconscious. * More comfortable (lighter and less bulky) than a lifejacket, may be designed for a specific sport and for recreational use only. Boat like you’re on the road. Many boating accidents are caused by the same factors that cause car accidents, including speed, careless or distracted driving, and poor visibility. Be sure to bring all of your safe driving habits with you when you’re operating a boat — and if your boat has a motor, you’ll need to bring your boating license with you, too. Don’t drink and boat. While it may be tempting to enjoy a few cold drinks on the dock before hitting the lake, boating while impaired (even in a canoe or kayak) increases your risk of an accident and could land you with the same penalties as drinking and driving. Simply put, don’t drink alcohol before you get behind the wheel or pick up a paddle. Don’t forget about boat insurance. While most home insurance policies include some coverage for certain types of watercraft, other types (larger models or ones with higher horsepower or modifications, for example) may require separate policies. Boat insurance could protect you in the event of damage or theft to your own boat or a liability claim that results from the use of your boat. If you have a boat or you’re thinking about buying one, reach out to your licensed broker to learn about your coverage options. Whether you’re an avid boater or just planning on renting a couple of kayaks at the lake this summer, take some time to review the Government of Canada’s safe boating practices and regulations before you hit the water.